Maybe there's something in the pastry cream at Brunetti. Or the air, like at casinos where they allegedly use sensory triggers to lure and keep punters at tables. Or maybe it's just Melbourne's history with this stalwart Roman-style pasticceria that means no matter how many seats it throws into the world (this new outlet, on Flinders Lane, adds 300 to an empire that now spreads from Carlton to Tullamarine and over to Singapore) every one is filled. Brunetti has serious fans, and has done since 1974 when it was a humble Lygon Street cafe that rose to cake-fuelled glory when acquired by Giorgio Angele in 1991. (Fun fact: Angele was a one-time pastry chef for the Italian Olympic team – all hail simpler times when triple gold for cycling was achieved by injecting biscotti). For a lot of dyed in the wool Melburnians, it always was and will be about the cakes. Eating a rum ball in a dark Carlton alley is a quintessential Melbourne experience, while anything short of a Brunetti profiterole tower or mudcake for parties is social suicide in some circles – Katherine Sabbath-style dribbles be damned. But since the flagship store moved to bigger digs opposite Cinema Nova in 2013, the remit has greatly expanded to include pizza, booze and gelato. Here on Flinders Lane, things are more serious still. 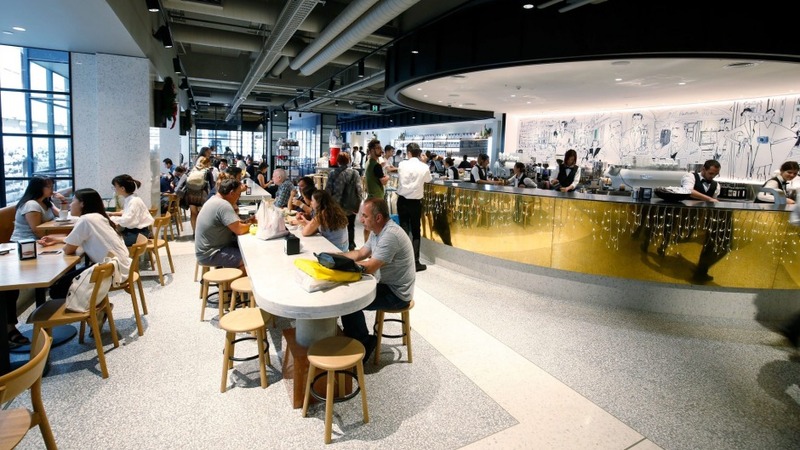 You enter through a glass tunnel of cakes that opens to the pasticceria on one side, retail shelves stocked with panettone and biscuits, with a marble mile of gelato counters and tables given a modern touch with pale blond stools beyond. And there's more: a deli stuffed with panini and then a full service kitchen where exec chef Simon Moss (Entrecote, Sapore) is delivering tweaked Italian dishes and pizze from a kitchen centring around a giant suspended pizza oven. It's quite something. And that's before you even get to the dedicated spritz bar. The whole operation can be a little overwhelming. There are no hosts, no instructions. It's not really clear where to go, how to get a menu or what rules of natural selection are at play. We head to the spritz bar to work it out over a drink and discover this pocket of about 12 tables is the only space where table service applies – everywhere else is a pay at the counter and take a number situation. 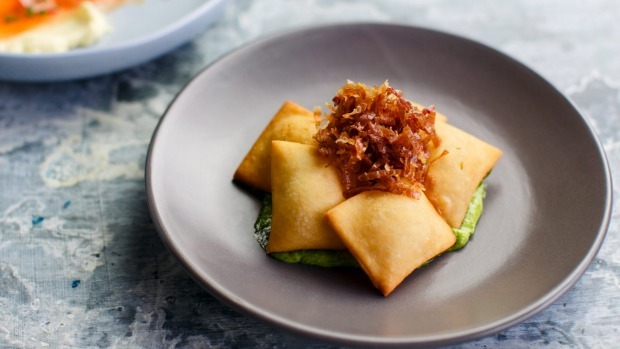 It's also where you can get at the cicchetti menu – Italian snacks like gnocco fritto, those deep fried pillows of pizza dough usually served with charcuterie. They're a little greasy, but it's hard not to find the drink-friendly suckers tasty anyway, scattered as they are with crisp prosciutto crumbs and salsa verde mayo. They work well as a litmus for the dining-in experience in that you will enjoy yourself best with expectations set to moderate. The service consists of a few friendly Italians dropping food and checking on your drinks when they happen to notice you. On the whole, that food is fine-to-good with bonus highlights but little to make the Tipo 00s of the world worry. The vitello tonnato is nudgeworthy – two thick slabs of chilled, blushed veal laid across well-flavoured tuna mayonnaise with bright capers for balance. 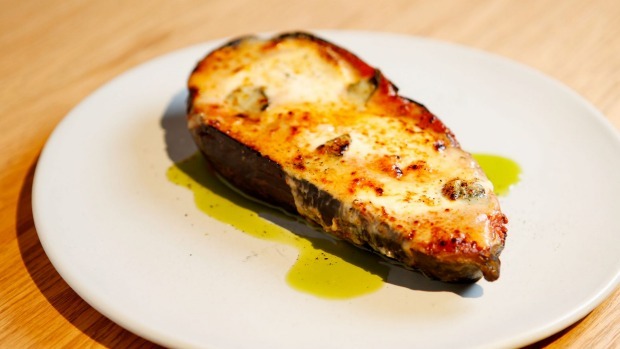 Don't go past the tricked-up eggplant parmiagana either, where all the bechamel, tomato and gruyere has been cooked right into a half eggplant itself so a knife probe leads to a molten river of richness. The spaghetti carbonara is properly stained deep yellow with egg yolk and peppered with crisp slips of guanciale (cured meat from the jowl), but it could use more seasoning. 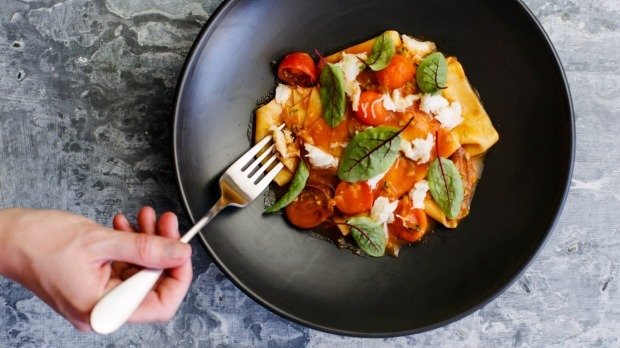 As could our fresh but bland spanner crab and tomato-zucchini lasagnette featuring loose sheets of pasta that have stuck together. Maybe a better bet is the gnocchi with ragu. And the pizze, coming out of that space-age oven properly charred around the rim. I can happily vouch for the baby gem salad – their caesar crowned with a perfectly soft-centred boiled egg. And aren't you here for a sly scoop of the nutty pistachio gelato anyway? And an eclair dusted with a little gold and piped with extremely firm chantilly cream, or one of those cartoonish little strawberry cakes shaped like a ruby red tear? Throw in a mid-shop negroni or sneaky prosecco and look, it does the job. Consider it like a beautifully glitzy Italian version of limbo – a waiting place that's not quite heaven, far from hell and properly stocked with everything an Italian or Italophile would demand in the purgatory that being stuck in the city can be. 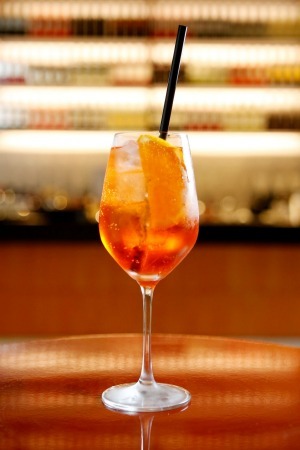 Drinks: OK selection of Italian wine varietals and beers; heavy-hitting negroni and spritz service. Vegetarian: Plenty of options in all sections. Pro Tip: Ideal for casual drop-in drinks and a couple of snacks before or after your city mission. Go-to Dish: Wood-fired eggplant parmigiana $12.